Suitable for intermediate plus fit riders. 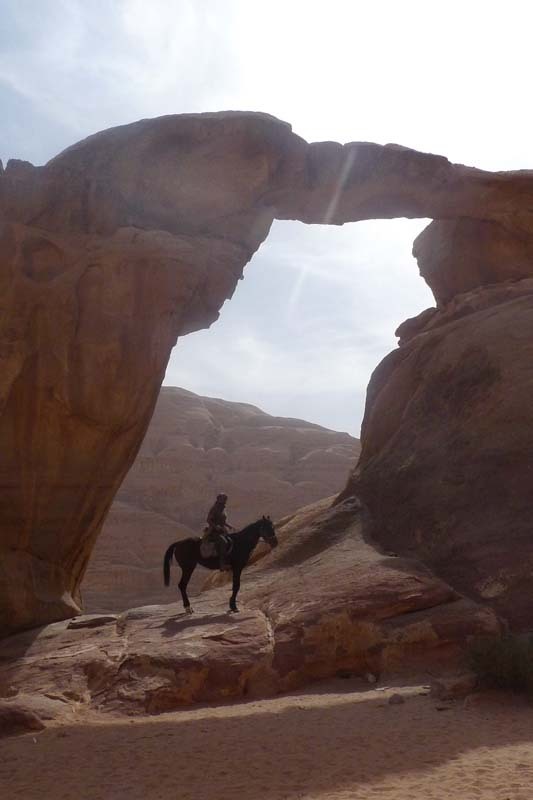 Includes – All the riding, accommodation, meals & entrance fees to Petra & Wadi Rum, plus the transfers. Excludes – Flights, drinks in the hotels, alcohol on the ride, lunch in Petra & Dead Sea & tips. The rides start on Saturdays for 9 nights and 10 days, finishing on Mondays. Airport transfers are included from Amman on the day of arrival between 16:00 and 01:00 and back to Amman on the day of departure up to 14:00. Transfers can be arranged at other times for an additional cost. 2-3 hour car transfer. 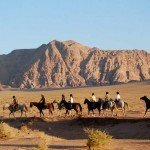 The Wadi Rum Desert Ride is an amazing horse riding holiday through Jordan’s spectacular desert scenery, littered with the monuments of another era, is a journey through history. This is a vast silent place, timeless and starkly beautiful. 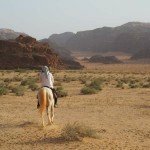 This is three holidays rolled into one – visiting Petra, one of the great sights of Jordan, riding across the Wadi Rum desert and finishing with a night at the Dead Sea. 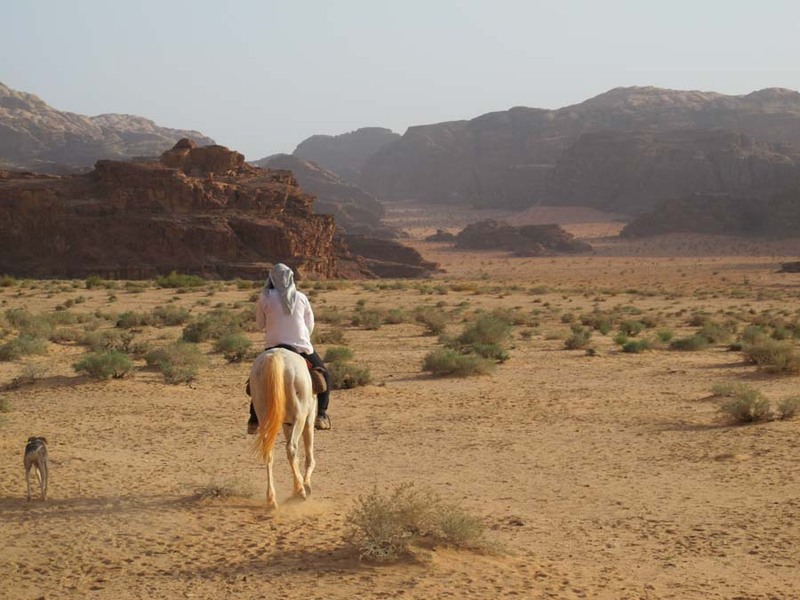 Your first or last day on the Wadi Rum Desert Ride, depending on which date you choose is spent exploring the amazing ruins of Petra, the ‘Rose Red City’ set deep inside a narrow gorge, its ornate facades were carved out of sandstone cliffs by the Nabataeans around 400BC. 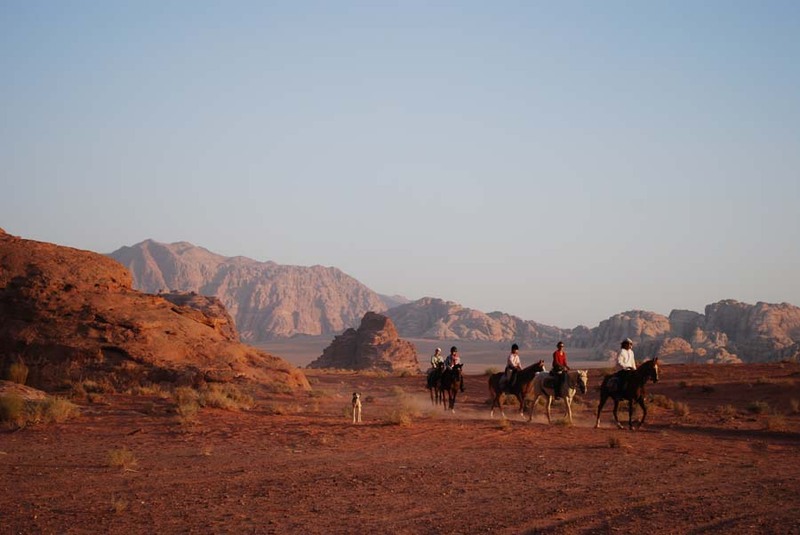 There are six glorious days spent exploring the Wadi Rum desert on horseback. The terrain varies from deep sand on high dunes, to stony desert and the hard packed sand of dry oases and as a result the pace varies with the terrain. 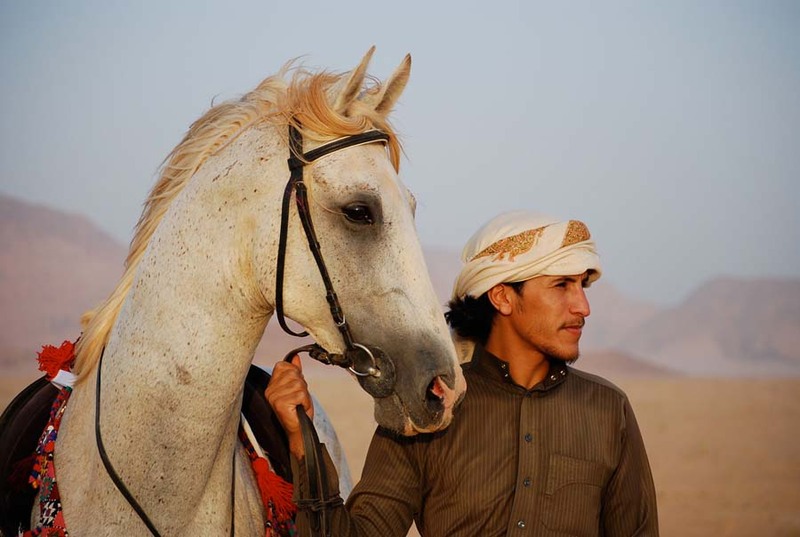 As you journey through the desert you will meet the Bedouin families, the nomadic people of this country, living in their traditional nomadic camps. 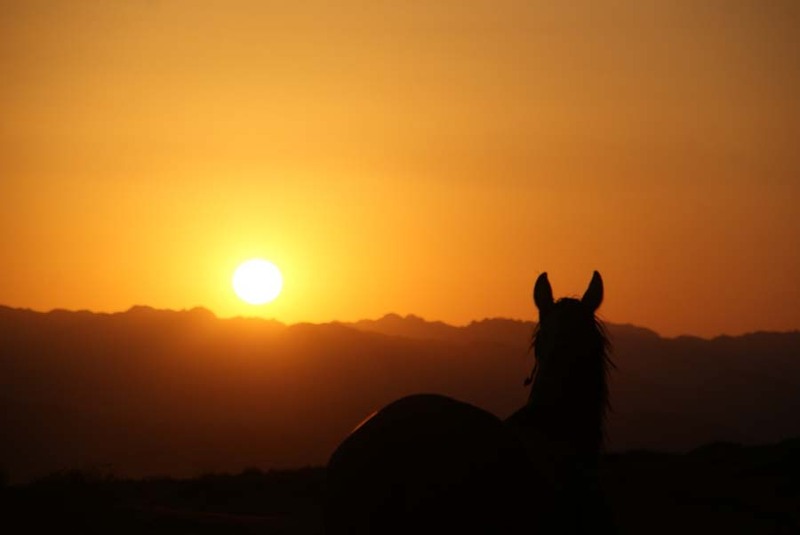 The perfect end to a day on horseback is to watch the sand turn from pink to deep orange as the sun sets, whilst eating delicious local dishes prepared over an open fire. Tents are provided but on warm evenings you may just prefer a mattress under the stars! You will rarely see a sky so black or stars so bright. 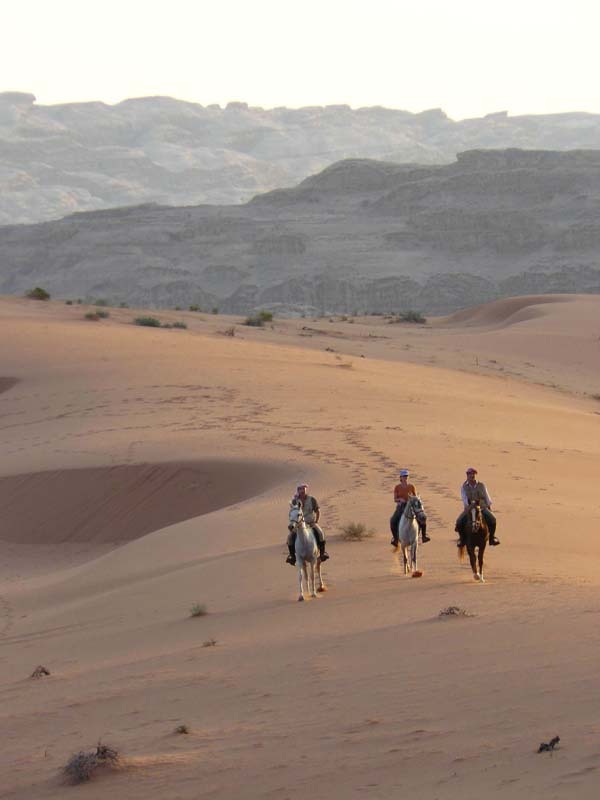 On the final day of the Wadi Rum Desert Ride you travel to the Dead Sea stopping at Kerak for lunch and spend the afternoon relaxing in the waters of the Dead Sea. 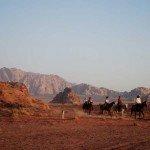 Wadi Rum Desert Ride : Horses – The horses are Bedouin Arabians, pure Arabians (WAHO Registered), Part-Breds and some Anglo Arabs. Their average size is 15.2hh. They are hot bloods originating from Jordan, Syria and Iraq. They are mainly mares and geldings and a couple of stallions. Weight Restriction – 85 Kg / 190 lbs / 13.5 Stones. There are 3 star and 4 star hotels for 4 nights for the sight-seeing part of the trip. 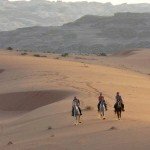 On the riding part of this Wadi Rum Desert Ride adventure, it is static Bedouin style camps used in the winter months and roomy dome tents for the moving camp in the summer months. All shared toilet/shower facilities. It is most definitely basic camping but at it’s best with great nights spent eating unbelievably good food round the camp fire. 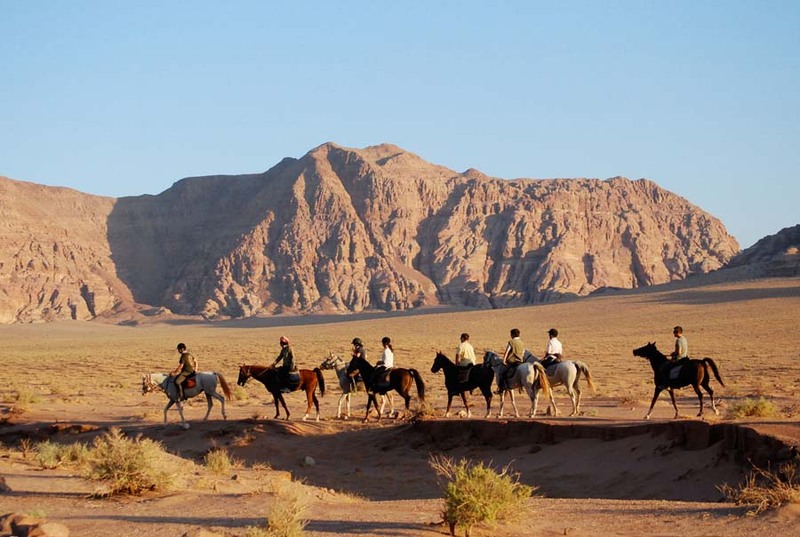 Horse Riding Holidays at Wadi Rum are part of the Zara’s Planet collection of Horse Riding Holidays Jordan. 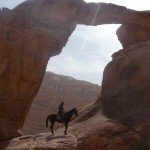 This trip covers most of the Wadi Rum area with its ever-changing scenery and includes a full day in Petra and a day of relaxing and swimming in the Dead Sea. Arrive in Amman, at Queen Alia International Airport, where you are met and driven to your hotel, normally the Mosaic City Hotel in Madaba (30 minutes). Overnight at your hotel. Early morning your bus will collect you to travel to Petra (around 2h 30min drive). A full day to visit the site. You have a 2 to 3 hour guided visit with an official guide and afterwards can wander on your own or return to your hotel. You will see the famous Treasury and then choose which sites to visit from the many on offer - the city centre, the Royal tomb, the theatre, the High Place of Sacrifice, the Monastery or the Roman Soldier Tombs. There are many small restaurants inside the site to have your lunch. Overnight at a 3* hotel located right at the entrance to Petra. Dinner at the hotel. After breakfast, your bus will drive you to Wadi Rum (around 1h 30min drive). Arrive in the village of Wadi Rum at the stables at around 9.30am. 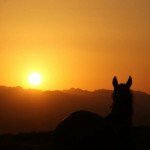 Time to drink the first bedouin tea, meet the horses and the team. The first ride is through Um Ishrin valley with a visit on the way to Lawrence’s well. After lunch you ride through an open valley with a view over the red sand area. 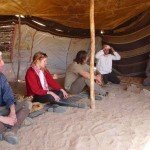 Dinner and camp in Abu Hassaran. After breakfast, you cross Rash Rasha valley with its red sands and go to Qatar mountain. There you see a spring and have lunch. After lunch, ride to Um Raza, where you set up camp for the night. 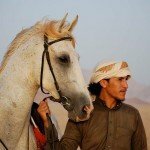 After breakfast, you ride onto Arab Antar, a natural cave famous for its legends. Lunch near Arab Antar, then continue to Sweibat valley which is c. 5 km from the Saudi border. Dinner and camp in Sweibat. After breakfast, you cross Barragh canyon, which is the longest canyon in Wadi Rum. Gaze at its monumental cliffs which are famous for rock climbing. Then you cross the Disseh plain and return the horses to their stable. Lunch at the stables. After lunch you are driven back to Madaba/Amman to check-in to your hotel and have dinner. Overnight in 3 star hotel in Madaba (or sometimes Amman). In the morning you visit Amman old city before being transferred to the Dead Sea where you spend the afternoon at your leisure. Mount Nebo is situated on the road between Madaba and the Dead Sea so you visit the site on either your outward or return journey. Dinner and night in a hotel in Madaba.